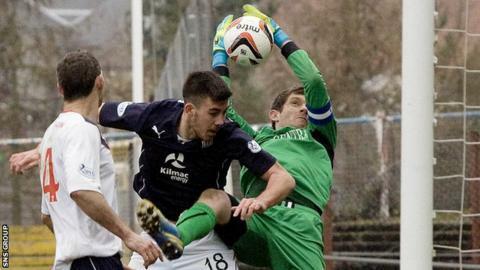 Falkirk goalkeeper Michael McGovern says the final three weekends of the Championship season will be "massive" in the race for promotion. Dundee lead the way on 63 points, two ahead of Hamilton, with the Bairns four adrift of top spot. "There will be a few twists and turns before the end of the season," predicts McGovern. "It's out of our hands. We'd rather be in Dundee's position. "But, from our point of view, all the pressure is on Dundee and Hamilton." The team finishing first will automatically replace demoted Hearts in the top flight, leaving the sides finishing second, third and fourth to compete in play-offs with the 11th-placed outfit in the Premiership. The teams finishing third and fourth would have to complete six games to be successful since they meet first. The runners-up take on the winner over two legs before the Premiership side gets involved in the final round of games. "We've got to go about our business and win all of our games and hope other teams do us a favour," McGovern, 29, told BBC Radio Scotland. "Obviously, our number one aim is to go up in first place but if we can't do that, then hopefully through the play-offs and finishing second would make a big difference. "That would give us one less double-header. "The games are over a short space of time and we don't have the biggest of squads." The three rivals at the top have all to face already-relegated Morton and Alloa, who are out of reach of fourth place, while Dundee and Hamilton each take on Dumbarton, who still have designs on fourth place, with Falkirk at home to Raith Rovers on Saturday. Queen of the South currently occupy fourth spot and play their game in hand, away to Raith Rovers, on Tuesday.